wren discovers a downed Eaglet while out for a paddle one evening! The full story with updates & fotos can be read here. HEART gets FOUR wildlife in distress calls in three days! A Flicker, a Fawn on the side of the road, a dead Fawn inside a greenhouse & an injured Great Blue Heron. The stories can be read here & here. A Golden-crowned Kinglet Bird & a Barred Owl are sent to MARS on the same day! The stories can be read here. i got a call just as i was heading out the door to work! A man on Mount Rd., near the ferry, had found what he called a Western Tanager, but without the red, he said. The Bird also had a curved beak, he said. i suggested this might be a Crossbill. This Bird had a broken wing! He had the Bird in a box with a capful of water & wanted to give her chicken scratch. i advised that he hold off on any food or water, & suggested he call MARS for advice, then wren or Aaron if he needed help or a kennel from my shed. i told him what i would do is get the covered Bird down to the ferry & beg the lineup for a ride to Buckley Bay or further north, to meet with MARS. i had to run, he said his truck was broken down, & i never heard back from him, so i wrote to Sarah at MARS, she is the Program Coordinator, & has been super helpful with my phone & e-mail questions. i had a call this morning from a man named P on Hornby who thought he had a Western Tanager with a broken wing. i told him to call you. i was hoping to hear back from him. Did the Bird make it in to you for help today? We had a crossbill come in from the Island today. She has a broken wing but we have it wrapped and hope it is a quick fix. Thanks for checking in. 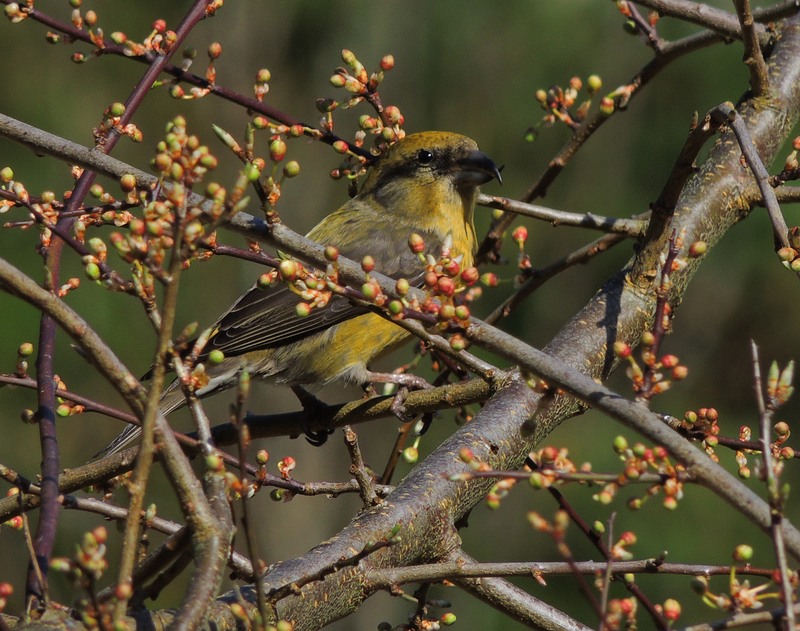 A female Crossbill would look like this. Heart has sure been busy! Excellent work you all. Looking forward to seeing you in a couple weeks. Yesterday on our way home from Tribune Bay tennis court checking out the Nest again, i spotted a Bird shape on the side of the road that just didn*t look right. The Bird looked alive, but not well. There was no one behind me so i backed up. At first i thought the Bird had left, but i just hadn*t backed up far enough. The Bird was still there, looked like a Song Sparrow, sort of tilted forward, looking stunned, so likely hit by a car. i was able to pick her up in a paper napkin & then i transferred her into a paper bag with the top folded & clipped with a clothespin & i let her rest in the shade for a while. When i came back to check, the bag was scritching & rattling, so we drove back to where i*d picked her up. A not so happy ending. i saw this poor Bird sleeping on top of the feeder & then on the ground in the yard. When i went out to check, there she was sleeping under the feeder. i was able to catch her under there with my hand no problem, & i put her in a kennel with a towel on the bottom & one overtop so she could rest. i was handed over to Reg & he said likely salmonella, Pine Siskins are very prone to have & carry & spread this. He said check if the vent was plugged with poop & if i put seed down & she eats right in front of me, these are both signs of salmonella, as it makes them ravenous. He also said clean the Bird feeder as this is highly infectious. 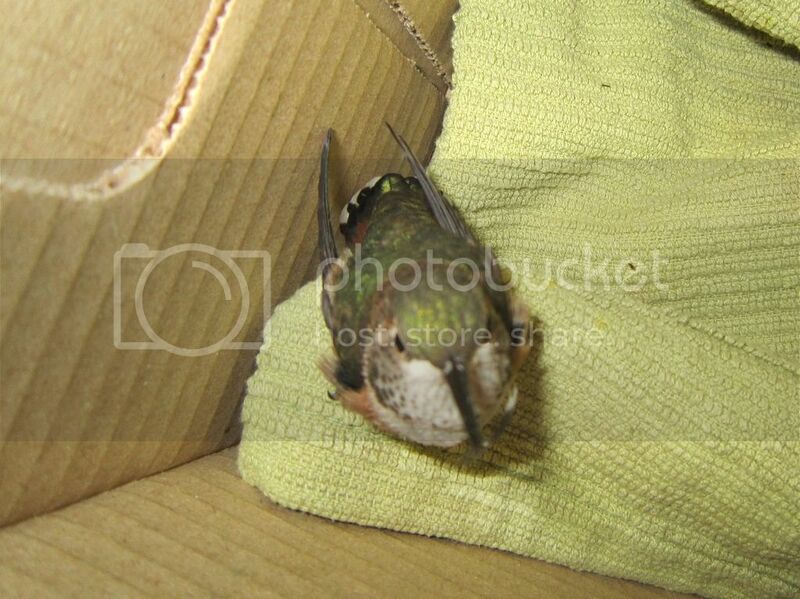 Well, the vent was not clogged & she didn*t eat seed, but i left her to rest & when i checked she had already died. i had to be careful to wash & sterilize everything afterwards, including my hands & the kennel, & i buried her away from other Birds. Awwwwwwww..... both lovely stories of birds in trouble! Love the sparrow scritching in the bag! We have problems with pine siskins dying from contact with feeders in California as well..... so I stopped filling my seed feeders this spring, feeling sure the birds can find enough natural seed. I notice a real drop in seed eaters to my woods... only see oak titmice now,no more finches.... But I'd rather not have sick birds! Thank you for sharing your experiences, Booni! I am sorry that your attempted rescue failed for the Siskin but you saved the little finch. What a hero you are Booni. Keep up the great work. Thank you for telling us about both birds, booni. A good outcome and one that didn't make it. You show us both sides of the natural world. Awwww. 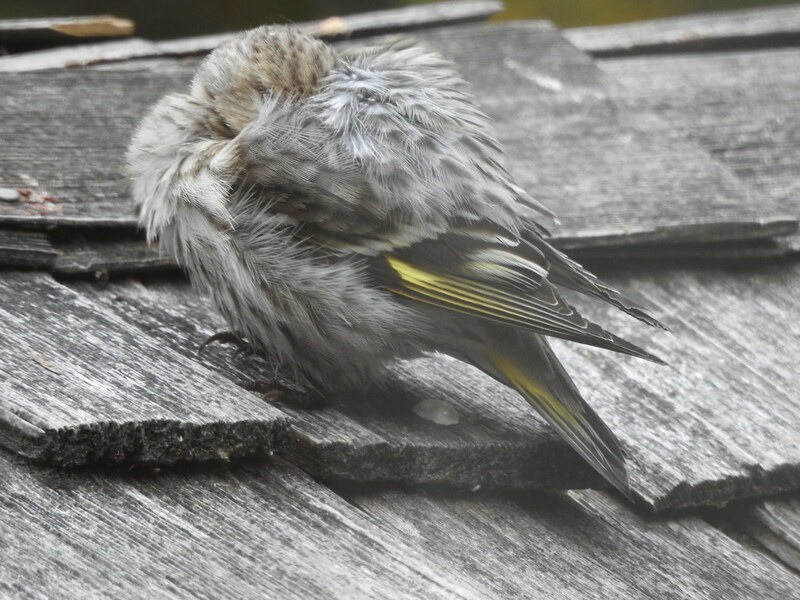 I heard that lots of Pine Siskins were sick this year, likely from Feeder infestations. Yesterday afternoon I received a phone call from Reg at MARS. 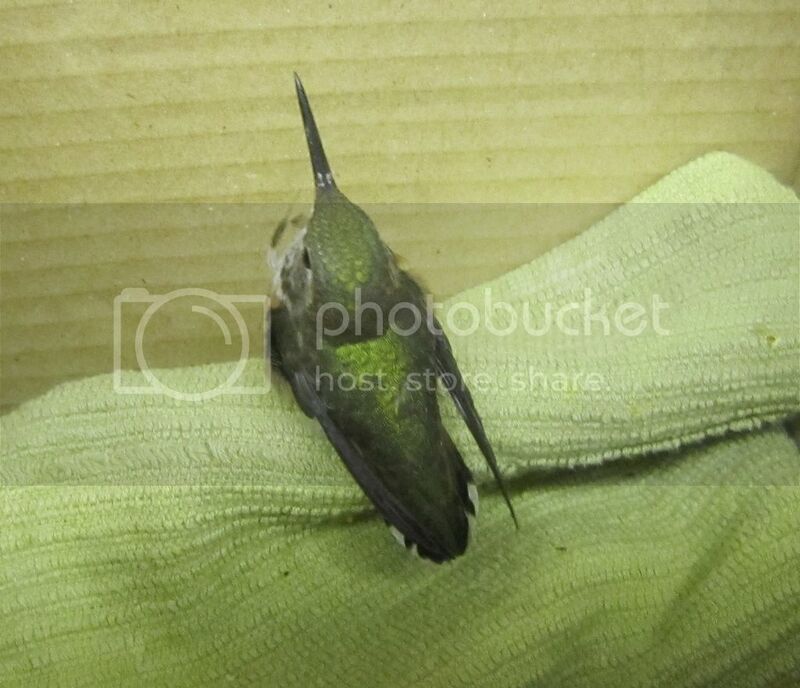 A lady on Hornby Island had found a hummingbird on her driveway that was unable to fly. She had put it in a small box & was heading to the ferry to see if she could find someone to take the bird over to Buckley Bay but needed someone to meet the ferry & transport to MARS. Was I available? “YES I was”. Reg gave her my number so we could co-ordinate. About an hour later she called to say she had found someone & they were on route. Off I went to Buckley Bay to meet an unknown person, unknown vehicle type, unknown vehicle colour, so I just stood by my vehicle in the parking lot at the gas station, watching the ferry unload, hoping the person would realize I was the transporter. A guy got out of his truck & looked over at me “are you Dawn”? Phew it worked! He handed over a little box along with a small jar that contained sugar water & told me that every so often he dipped his finger into the nectar which the bird readily accepted. Not wishing to take a chance of an escaping hummer in the vehicle, I did not lift the lid to take a look. So off to MARS we go with the box tucked between my feet (no I was not driving). Once at MARS we were met by 2 young ladies who lifted the lid so I could then get a look at a lovely adult female Rufous hummingbird, she made no attempt to flap her wings, just kept turning her head & looking at all of us with her lovely bright eyes. I will try to contact Reg in the next day or so for an update, she is in good hands now and hope there is nothing seriously wrong. Thank you for helping this hummer, Dawn. You did a real -ful deed! Thank You! Best wishes to this sweetie.